This stuff I’m typing here? These characters combined in a myriad of different ways, with spaces between? They mash up to form something called “words”. And although I’ve said it on more than one occasion, my mind still reels when I hear that people don’t get the fact that words actually do mean things. But…seriously….? 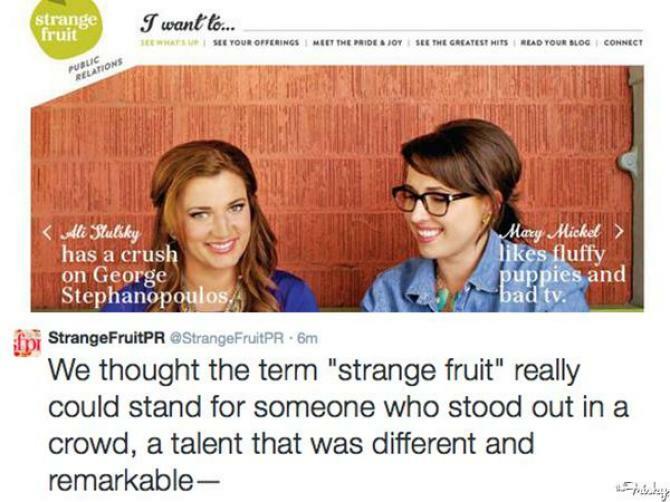 How brain numb do you need to be to know that you should NOT name your PR firm “Strange Fruit PR”??? Because a PR firm in Austin, TX did just that. And now, thanks to the Twitterverse, this company is changing it’s name. Albeit reluctantly. PR stands for “public relations”…..it means you can help others – businesses, individuals, institutions – RELATE to the PUBLIC. It means you have such a grasp on the zeitgeist that you can “sell” a business or product to the folks out there that might want it. It wouldn’t be top of mind in the public consciousness. The head of a PR firm said it wouldn’t be BAD PR to name her company “Lynched Black Men PR”. And she wants to do the PR for your new hipster salad joint, fusion taco establishment or ironically named gastropub. Run out and hire them now, as, they are apparently geniuses. Apparently, after hearing the song, and knowing what it meant, they felt that they could co-opt it because “We chose our name bc these incredibly talented artists stand out in a crowd.”, they even tried to deflect things by saying “We believe in hospitality. Including all. No exclusion. The author & its famous singer hoped for a world where that would be a possibility.” (both quotes from their now defunct Twitter account). Oh…so two white ladies from the South have decided to take back a term that previously meant “lynching black men” and make it something positive? Ask Paula Deen how well that works. Or Dan Snyder. Strange Fruit represents some of the area’s best-known restaurants, including Barley Swine, Odd Duck, Lenoir and Banger’s. None of those clients have indicated they plan to stop working with the firm as a result of the controversy, Mickel said. But at least one client, Jack Allen’s Kitchen, said online that it planned to have discussions with the agency. I don’t wish ill on anyone. Really I don’t. But, I for one would never do business with a firm like this. This whole incident speaks not only to the personal character of the two owners, but to their inability to RELATE to the PUBLIC.